Wield over 20 years of excellence with the FP5 Field Pup II Knife from SOG. Featuring a high gloss satin finish, the knife is a true beauty to behold. A full length tang constructed from 7Cr17MoV steel provides a virtually unbreakable base for this powerful fixed blade. The drop-point style tip allows for a longer spine, increasing the blade's strength and puncturing power. 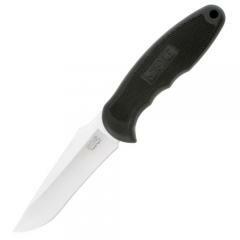 The contoured Kraton handle has been custom-molded to encase the tang while providing a comfortable, balanced hold. The textured exterior combined with integrated finger grooves allow for optimal knife control and retention.